Yesterday was one of those days where I wanted nothing more than to spend every available minute in the kitchen. And with the exception of a few domestic chores, that is exactly what I did! I’ve had muffins floating around my brain for the past few weeks and decided the time had finally come to test out a few ideas. It’s no secret that I have a wicked sweet tooth! I put too much sugar in my coffee, cake is my favorite food, and if allowed I could easily put down back-to-back pints of Ben & Jerry’s Phish Food and Half Baked. Yeah, it’s that serious. Fortunately, I posses enough self-control to keep myself from going overboard! I’ve found that a daily dose of sweetness is just enough to keep me on the straight and narrow. So when I was dreaming up healthy alternatives to the cake-like muffins I really wanted to make, I was reminded of all my jams and jellies quietly calling out to me from the basement. Preheat oven to 400°F. In a medium bowl whisk together both flours, baking powder, baking soda, and salt. In a large bowl combine eggs, milk, vanilla, brown sugar, oil, and orange juice. Slowly add the dry ingredients to the wet ingredients and mix until barely blended; be careful to not over-mix the batter or your muffins will become tough. In a separate bowl mix fruit spread and almond extract. 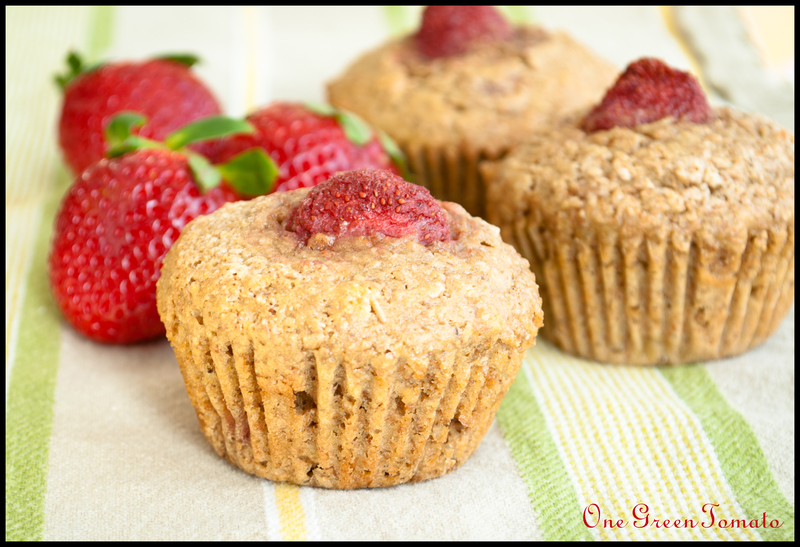 Fill muffin cups halfway with batter and spoon in 1 tsp of the fruit spread, then top off with more batter. 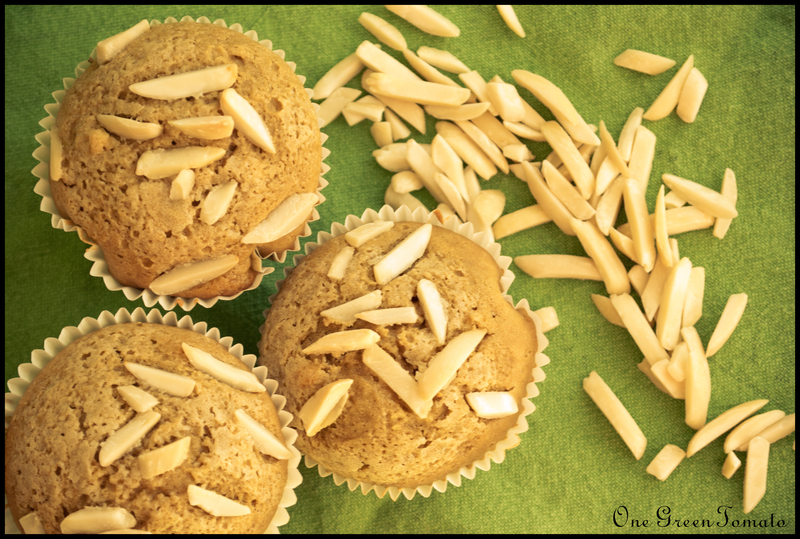 Lightly dust on a bit of granulated sugar and a sprinkling of sliced almonds. Bake for 20 minutes at 400°F or until you can insert a toothpick and it comes out clean. Transfer muffins to a wire rack and allow to cool 5-10 before eating. Recipe yields approximately 14 muffins. Preheat oven to 400°F. In a medium bowl whisk together both flours, baking powder, baking soda, and salt. In a large bowl mix eggs and brown sugar until smooth; add milk, vanilla, wheat bran, oil, bananas, and strawberries and mix until well incorporated. Slowly add the dry ingredients to the wet ingredients and mix until barely blended; be careful to not over-mix the batter or your muffins will become tough. Pour into muffin cups and lightly dust on a bit of granulated sugar and top off with a strawberry. Bake for 20 minutes at 400°F or until you can insert a toothpick and it comes out clean. Transfer muffins to a wire rack and allow to cool 5-10 before eating. Recipe yields approximately 18 muffins. Both of my taste-testers were very happy with the outcome of these recipes, so much so that one suggested I open a bakery. While I don’t think they are that amazing, judging by the ratio of eaten to non-eaten muffins left on the counter, I had better make another batch, SOON! Images and content copyright © 2013 Danielle R Limoge. I am so ALL over those jam filled ones! They look and sound amazing!! Steph, you will not be disappointed! Enjoy! !